Check out the 1947 Ford Coe Wrecker by Jada and of their Heat Collection. This classic oldie has suicide opening doors and a sliding flat bed on it. 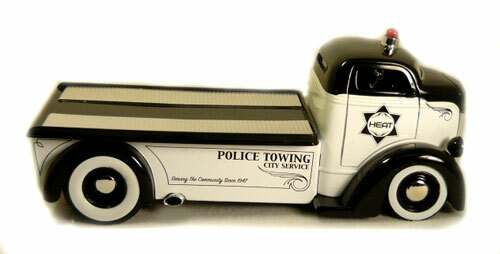 It has a detailed paint job with "Police Towing City Service" on side of the bead and awesome pin striping. The detailed interior is black and has chrome peddles, shifter and steering wheel. It comes with super wide rear whit wall tires, stander size tires on the front with white walls and chrome moon hub caps. = Shipping weight is 1.3 lbs.